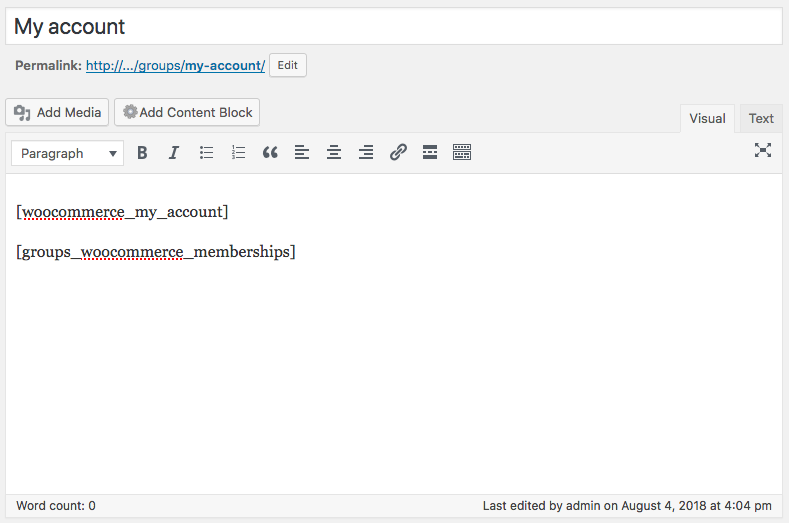 The [groups_woocommerce_memberships] shortcode renders group membership information for the current user. 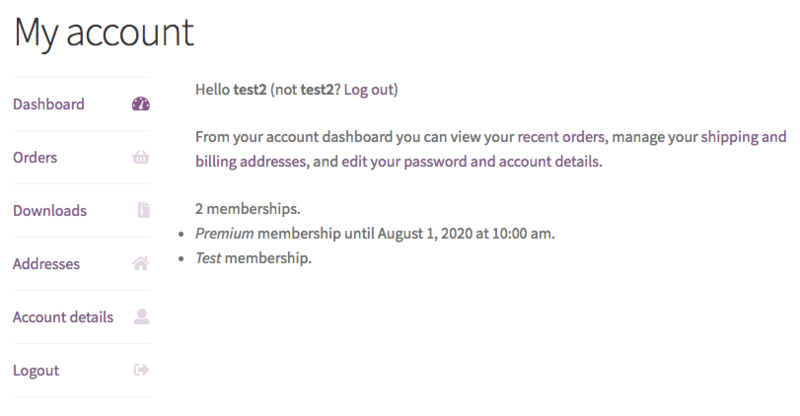 Each valid membership displays the group, for time-limited memberships, the date and time until the membership is valid is shown, too. Please note that membership info with the Registered group is not displayed, as this is a fixed group to which all users belong. The shortcode can be customized using the following attributes. exclude : A list of group names separated by comma. Membership information related to these groups is not shown. The Registered group is excluded by default. show_count : Whether to render the number of valid memberships. Enabled by default, use “false” to disable. count_0 : When showing the number of membership, the message to render for 0 valid memberships. count_1 : The message to render for one valid membership. The [groups_woocommerce_subscriptions_table] shortcode can be used to list a user’s subscriptions and related group memberships. To use this shortcode, the WooCommerce Subscriptions extension is required. It will not render any output if the extension is missing. status : Subscription status, defaults to active. Can be a comma-separated list containing any of active, on-hold, cancelled, trash, deleted. Use * for all subscriptions. user_id : Defaults to the current user’s id, accepts user id, email or login. show_count : If info about how many subscriptions are listed should be shown. Defaults to “true”. show_table : If the table should be shown. Defaults to “true”. columns : Which columns should be included. Defaults to all columns. Specify one or more of status, title, start_date, expiry_date, end_date, trial_expiry_date, groups or order_id.